The road to becoming an IP nation is a path that Malaysia wishes to walk to become a high income nation. What are the challenges to increasing innovation in Malaysia? What we can learn from the American and Japanese experience? 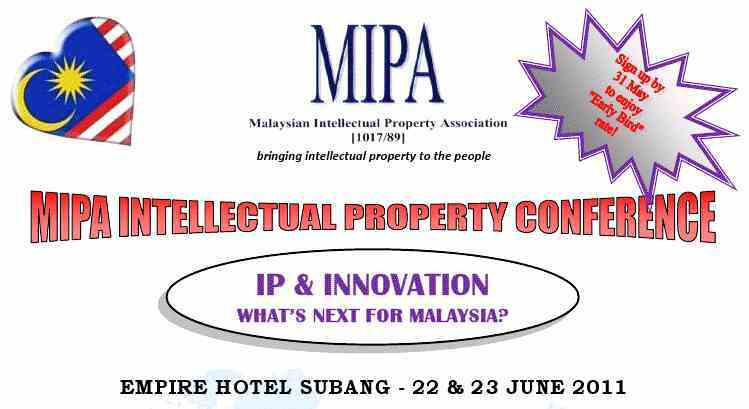 The Malaysian Intellectual Property Association (MIPA) is proud to host an Intellectual Property conference to present the latest issues and development of IP. How to create and build a strong brand? Malaysia may join Madrid Protocol this year. What are the implication of Madrid Protocol to trademark owners? 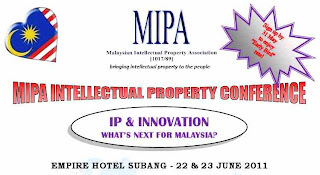 Technology search, green technology, investing in IP and other informative intellectual property matters which creates an impact in Malaysia's innovation landscape are presented in this two day event on 22 & 23 June 2011, Empire Hotel, Subang Jaya. Come listen to experts from USA, Japan, academicians, IP practitioners, MyIPO board member and representative from the newly formed UNIK corporation. It is a not to be missed event for business leaders, intellectual property owners, corporate counsel & lawyers interested in one of Asia's most dynamic countries.